By 1909 the first daring flights were made from the Hempstead plains in the central part of Nassau County. Because the flat, open landscape made a natural airfield, famous aviator Glenn Curtiss brought his biplane the "Golden Flyer" here. By 1910 there were three airfields operating on the Hempstead Plains, and Long Islanders were now building their own airplanes. Several flying schools and aircraft factories also sprang up and Long Island became the center of the aviation world. By far the most important aeronautical event on Long Island up to this time was the 1910 International Aviation Meet at Belmont Park. The greatest aviators from all over America and Europe came to Long Island to show their latest flying machines, race, set records and win prize money. A similar meet was held at the Nassau Boulevard airfield in Garden City in 1911, and the first official air mail flights in the United States were the featured events. Also in 1911 the first transcontinental flight occurred when Cal Rodgers, in a Wright biplane, flew from Long Island to California in 49 days. Hazelhurst Field, N. Y. was a temporary flying field under lease, located on the Hempstead Plains at Mineola, Long Island.The field was also known as aviation Field No. 1 and included included Field No. 2, later known as Mitchel Field. The field was named in honor of 2d Lt. Leighton W. Hazelhurst, Jr., 17th Inf., who was killed in an aviation accident, June 11,1912. Established, June 1916 on property previously used by New York National Guard as an aviation field. Flying started June 1916 with capacity of 50 students from junior officers of the line detailed to Aviation Section, Signal Corps. Served as training field until July 9, 1918, when placed under jurisdiction of Operations Section, Department of Military Aeronautics. Additional construction began July 26, 1917. From June 7, 1918 to Feb. 7, 1919, referred to as Headquarters First Provisional Wing or Headquarters First Reserve Wing. Headquarters 1st Provisional Wing: The Wing controlled all flying fields on Long Island ; its principal function, aside from the defense of New York City, was the training of squadrons as units for oversea duty and development of team work in advanced flying. Used as reception center for Air Service recruits. In 1917, a new army aviation field, Field #2, was established just south of Hazelhurst Field to serve as an additional training and storage base. Jennies became a common sight over Long Island in 1917 and 1918. Hundreds of aviators were trained for war at these training fields, two of the largest in the United States. Numerous new wooden buildings and tents were erected on Roosevelt and Field #2 in 1918 in order to meet this rapid expansion. In July 1918, Field #2 was renamed Mitchel Field in honor of former New York City Mayor John Purroy Mitchel who was killed while training for the Air Service in Louisiana. Mitchel Field continued to grow after World War I and between 1929 and 1932 a major new construction program was undertaken. New brick barracks, officer's clubs, housing, warehouses, and operations buildings were constructed, as well as eight massive steel and concrete hangars. Much of this construction remains in place today. Between the wars Mitchel was the Army's premier air corps base, somewhat of a military Country Club atmosphere with fine housing, clubs, pools, polo fields and tree-lined streets. It became home to several observation, fighter and bombardment groups and it hosted the 1920 and 1925 National Air Races. In 1938, Mitchel was the starting point for the first nonstop transcontinental bomber flight, made by Army B-18s. Mitchel Field also served as a base from which the first demonstration of long-range aerial reconnaissance was made. In May 1939, three B-17s led by Lt. Curtiss Lemay flew 750 miles out to sea and intercepted the Italian ocean liner Rex. This was a striking example of the range, mobility and accuracy of modern aviation at the time. During World War II, Mitchel was the main point of air defense for New York City, equipped with two squadrons of P-40 fighters. In the late 1940s it was headquarters of the Air Defense Command, First Air Force and Continental Air Command. The known limits of flight were expanded regularly in the skies over Long Island. In 1923 the first non-stop flight across America was made from Long Island to California. New speed records were also set at the National Air Races held at long Island's Mitchel Field in 1920 and 1925. During this period major aviation manufacturers were established on Long Island including Curtiss and Sikorsky in Garden City, Sperry and Fairchild in Farmingdale, and Brunner-Winkle in Queens. Thus hundreds of new civil, commercial and military aircraft were built in the 1920s and 1930s. During World War II, locally built aircraft clearly helped America win victory as many aspects of American fighter operations were dominated by Long Island built aircraft. The demands of war brought tremendous growth in the aircraft industry on Long Island and by 1945 over 100,000 people worked in the industry here. Two large companies dominated the Long Island work force during the war, Grumman and Republic. Grumman, founded in 1930, produced primarily Naval biplane fighters before the war, and during World War II, their Wildcat, Hellcat and Avenger proved to be outstanding Navy fighters and bombers. In fact, most of the Japanese aircraft shot down in World War II were shot down by Grumman planes. Republic, founded in 1931, built over 15,000 P-47 Thunderbolts during World War II, the Army Air Corps' outstanding mainstay fighter in Europe. Other companies in Long Island contributing to the war effort were Sperry, Brewster, Ranger, and Columbia. HDM: My father, Howard Marshak, worked for Republic designing fighter planes during WW II. The area he worked in was so secret that FBI agents went into the bathroom with him to be sure he didn't leave any plans there. Continuing a long tradition of AEW Aircraft development by Grumman, ranging from the Avenger and Guardian to the Hawkeye, the WF-2 Tracer was designed to replace the aging Guardians and Skyraiders providing AEW coverage for US Navy aircraft carriers. The Tracer was developed from the S-2 Tracker anti-submarine warfare aircraft and first flew on March 1, 1957. 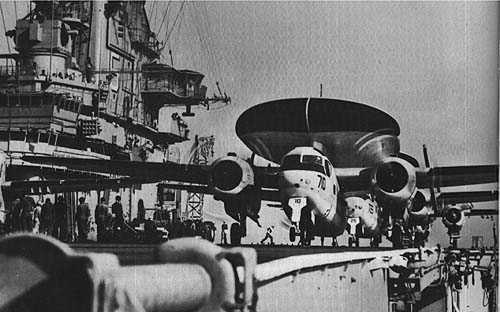 The fitting of a large radar dome to the Tracer entailed significant modification from the standard ASW Tracker including the removal of the large single tail fin and replacing it with two end-plate fins on the tailplane. The radar fitted to the Tracer was the new AN/APS-82 manufactured by Hazeltine, original builders of the AN/APS-20 which was the first AEW radar ever used. The AN/APS-82 introduced many technological advances including stabilized antenna and Airborne Moving Target Indicator (AMTI) which allowed the radar to detect low flying targets against the clutter of radar reflections from the surface of the ocean. 88 WF-2 and E-1B Tracers were built by Grumman for the US Navy with operations extending from 1958 to 1977 when the E-2 Hawkeye completely replaced the aircraft in service.